Leicester came from a goal down to beat Leeds and seal their place in the third round of the Carling Cup thanks to Steve Howard's last-minute penalty. Davide Somma followed up his league-debut brace on Saturday by heading Leeds into the lead on the half hour. Midway through the second half, Richie Wellens exchanged passes with Steve Howard and fired the visitors level. Neil Collins's handball in the box in the final minute saw a penalty awarded, which Howard converted to win it. "We did OK first half but as the game went on we became sloppy. "It's frustrating because I wanted to build on the result on Saturday and use that as a platform to build on. "But we have to accept there are areas of the game where we need to improve." "We have deserved much more than we have got so far this season and this win will encourage everyone. "We started the game well and controlled it but with one small mistake we conceded a goal and that disturbed the players. "We reflected on that at half time, prepared for the second half and went out to win the game. We deserved the win and it can help towards our development to get results regularly." 93:41 The ref blows the whistle to start the match. Correction - 90:00+3:00 Attacking throw-in by Max Gradel (Leeds). 90:00+3:00 Attacking throw-in by Federico Bessone (Leeds). 90:00+1:35 Attacking throw-in by Paul Connolly (Leeds). 90:00+1:12 Inswinging corner taken by Max Gradel from the left by-line, clearance made by Steve Howard. 90:00+0:20 Max Gradel crosses the ball from the free kick right-footed from left wing. 90:00+0:20 Substitution Robbie Neilson on for Michael Lamey. 90:00+0:20 Unfair challenge on Max Gradel by Michael Lamey results in a free kick. 90:00 The game is over, as the referee blows his whistle. 88:30 GOAL - Steve Howard:Leeds United 1 - 2 Leicester Power penalty scored by Steve Howard. Leeds 1-2 Leicester. 87:57 The referee gives a against Neill Collins for handball. 87:09 Max Gradel concedes a free kick for a foul on Dany N'Guessan. Richie Wellens takes the direct free kick. 85:01 Goal kick taken long by Conrad Logan (Leicester). 84:20 Goal kick taken long by Conrad Logan (Leicester). 84:06 Shot from just outside the box by Davide Somma misses to the left of the goal. 82:23 Corner taken by Max Gradel played to the near post, clearance made by Andy King. 82:02 Attacking throw-in by Paul Connolly (Leeds). 81:16 Goal kick taken short by Conrad Logan (Leicester). 79:37 Jack Hobbs fouled by Davide Somma, the ref awards a free kick. Free kick taken by Conrad Logan. 78:56 Corner taken by Paul Gallagher, Michael Morrison takes a shot. Save made by Shane Higgs. 78:47 Dany N'Guessan takes a shot. Blocked by Neill Collins. 77:43 Max Gradel sends in a cross, clearance made by Michael Morrison. 77:31 Tom Kennedy crosses the ball, save by Shane Higgs. 76:33 Attacking throw-in by Bradley Johnson (Leeds). 75:34 Federico Bessone delivers the ball, Michael Morrison makes a clearance. 73:30 Andy King is ruled offside. Shane Higgs takes the free kick. 71:21 Substitution Luciano Becchio goes off and Sanchez Watt comes on. 71:21 Substitution Jonathan Howson leaves the field to be replaced by Andy Hughes. Correction - 71:01 The ball is swung over by Paul Gallagher, Steve Howard takes a shot. Save by Shane Higgs. 71:01 The ball is sent over by Paul Gallagher, Steve Howard takes a shot. Save by Shane Higgs. 70:41 Attacking throw-in by Michael Lamey (Leicester). 69:52 Defending throw-in by Federico Bessone (Leeds). 68:34 Corner taken by Paul Gallagher from the left by-line played to the near post, Max Gradel manages to make a clearance. 67:20 Substitution Franck Moussa goes off and Tom Kennedy comes on. 65:18 Assist by Steve Howard. 65:18 GOAL - Richie Wellens:Leeds United 1 - 1 Leicester Richie Wellens grabs a goal from deep inside the penalty box to the bottom left corner of the goal. Leeds 1-1 Leicester. 64:11 Attacking throw-in by Federico Bessone (Leeds). 64:01 Attacking throw-in by Federico Bessone (Leeds). 62:41 Dany N'Guessan produces a cross. 62:17 Michael Lamey takes a shot. Blocked by Paul Connolly. 61:21 Defending throw-in by Bruno Berner (Leicester). 60:49 Defending throw-in by Bruno Berner (Leicester). 58:41 Davide Somma is ruled offside. Indirect free kick taken by Michael Morrison. 58:16 Defending throw-in by Federico Bessone (Leeds). 56:07 Free kick awarded for an unfair challenge on Andy King by Neil Kilkenny. Paul Gallagher takes the free kick. 54:45 The assistant referee flags for offside against Steve Howard. Shane Higgs restarts play with the free kick. 54:11 Goal kick taken long by Conrad Logan (Leicester). 53:59 The ball is sent over by Neil Kilkenny, Bradley Johnson has a headed effort from close in and clears the bar. 53:19 Attacking throw-in by Federico Bessone (Leeds). 52:56 Paul Gallagher takes a shot. Save by Shane Higgs. 51:48 Luciano Becchio challenges Michael Morrison unfairly and gives away a free kick. Michael Lamey takes the direct free kick. 50:41 Foul by Jonathan Howson on Dany N'Guessan, free kick awarded. Bruno Berner sends in a cross, Headed effort from close range by Michael Morrison goes wide left of the goal. 49:09 Paul Connolly takes the direct free kick. 49:09 Booking Richie Wellens receives a caution for unsporting behaviour. 48:42 Free kick awarded for a foul by Richie Wellens on Max Gradel. 47:40 Attacking throw-in by Michael Lamey (Leicester). 46:43 Foul by Michael Lamey on Bradley Johnson, free kick awarded. Centre by Neil Kilkenny, Davide Somma takes a shot. Jack Hobbs gets a block in. 46:03 Davide Somma takes a shot. Blocked by Jack Hobbs. Luciano Becchio takes a shot. Jack Hobbs gets a block in. 45:32 Attacking throw-in by Paul Connolly (Leeds). 45:02 Substitution Andy King is brought on as a substitute for Joao Moreno. 45:00+0:27 Goal kick taken long by Shane Higgs (Leeds). 45:00+0:17 The ball is delivered by Bruno Berner, Headed effort from inside the box by Steve Howard misses to the right of the target. 45:00+0:04 Attacking throw-in by Bruno Berner (Leicester). 44:40 Defending throw-in by Bruno Berner (Leicester). 43:58 Neil Kilkenny takes a outswinging corner from the right by-line to the near post, Joao Moreno manages to make a clearance. 42:54 Attacking throw-in by Federico Bessone (Leeds). 42:30 Bruno Berner produces a cross. 41:52 Defending throw-in by Federico Bessone (Leeds). 41:29 Attacking throw-in by Michael Lamey (Leicester). 40:38 Attacking throw-in by Michael Lamey (Leicester). 40:04 Attacking throw-in by Paul Connolly (Leeds). 39:34 Defending throw-in by Michael Lamey (Leicester). 38:03 The assistant referee signals for offside against Davide Somma. Indirect free kick taken by Conrad Logan. 37:37 Michael Lamey fouled by Bradley Johnson, the ref awards a free kick. Conrad Logan restarts play with the free kick. 34:55 Booking Caution for Paul Gallagher. 33:18 Neill Collins fouled by Paul Gallagher, the ref awards a free kick. Shane Higgs restarts play with the free kick. 32:24 Free kick awarded for a foul by Neill Collins on Steve Howard. Direct effort from the free kick comes in from Paul Gallagher. 31:01 Assist by Max Gradel. 31:01 GOAL - Davide Somma:Leeds United 1 - 0 Leicester Davide Somma finds the net with a headed goal from close range. 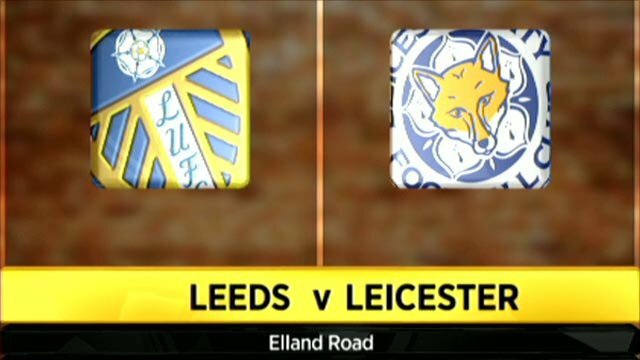 Leeds 1-0 Leicester. 30:27 Neil Kilkenny takes the outswinging corner, Joao Moreno manages to make a clearance. 30:10 Max Gradel takes a shot. Save by Conrad Logan. 28:49 Unfair challenge on Steve Howard by Neil Kilkenny results in a free kick. Free kick taken by Joao Moreno. 28:24 Goal kick taken long by Conrad Logan (Leicester). 27:40 Corner taken by Neil Kilkenny from the right by-line, Header by Alex Bruce from deep inside the penalty area misses to the right of the target. 27:08 Steve Howard takes a shot. Save made by Shane Higgs. 26:23 The referee blows for offside against Richie Wellens. Free kick taken by Shane Higgs. 25:41 Defending throw-in by Michael Lamey (Leicester). 25:13 Goal kick taken long by Shane Higgs (Leeds). 24:29 Inswinging corner taken right-footed by Paul Gallagher, Close range headed effort by Jack Hobbs goes wide of the left-hand post. 24:15 Shot by Dany N'Guessan. Shane Higgs makes a save. 23:48 Defending throw-in by Bruno Berner (Leicester). 23:03 Paul Gallagher is caught offside. Free kick taken by Shane Higgs. 21:40 Steve Howard takes a shot. Save by Shane Higgs. 20:40 Defending throw-in by Federico Bessone (Leeds). 19:53 Goal kick taken long by Shane Higgs (Leeds). 18:02 Unfair challenge on Dany N'Guessan by Max Gradel results in a free kick. Direct free kick taken by Richie Wellens. 17:50 A cross is delivered by Bradley Johnson, clearance made by Michael Morrison. 17:05 Steve Howard is flagged offside by the assistant referee. Indirect free kick taken by Shane Higgs. 16:38 Defending throw-in by Paul Connolly (Leeds). 16:13 Goal kick taken long by Conrad Logan (Leicester). 15:38 The referee blows for offside against Paul Gallagher. Indirect free kick taken by Shane Higgs. 14:36 Foul by Neil Kilkenny on Richie Wellens, free kick awarded. Richie Wellens takes the free kick. 14:00 Attacking throw-in by Michael Lamey (Leicester). 13:45 Defending throw-in by Federico Bessone (Leeds). 13:12 Davide Somma is caught offside. Michael Morrison takes the free kick. 10:42 Franck Moussa is ruled offside. Shane Higgs takes the free kick. 7:51 Alex Bruce gives away a free kick for an unfair challenge on Steve Howard. Paul Gallagher restarts play with the free kick. Steve Howard is ruled offside. Indirect free kick taken by Shane Higgs. 7:36 Goal kick taken long by Conrad Logan (Leicester). 6:50 Handball decision goes against Michael Lamey. Neill Collins takes the free kick. 5:49 Goal kick taken long by Conrad Logan (Leicester). 4:35 Joao Moreno produces a cross, save by Shane Higgs. 3:41 Defending throw-in by Bruno Berner (Leicester). 3:28 Attacking throw-in by Federico Bessone (Leeds). 2:28 The offside flag is raised against Davide Somma. Conrad Logan takes the indirect free kick. 1:32 The assistant referee signals for offside against Luciano Becchio. Free kick taken by Conrad Logan. 0:32 Attacking throw-in by Paul Connolly (Leeds).